Haydn Michael Tijerina joined UT Health East Texas EMS|AIR1 on Dec. 3, 2018, and is already making a difference in his patients’ lives. On Jan. 21, Haydn and his partner responded to an individual living alone. The house was not in good living condition; no doors, windows, heat or air conditioning, the refrigerator was not working and there was no toilet. This individual only ate canned goods out of a can. The patient had water, but electricity was through an extension cord that was run to the neighbor’s house providing for a space heater and lamp. He only had a blanket for the door as a barrier from the outside weather. This individual has tried to get into an assisted living with no success. Haydn rendered the medical aid needed for that call, but felt there was more to be done. After his shift, Haydn reached out to several individuals- from his pastor to several contactors that he knew- to assist this individual. A local church is helping him through their food pantry. One pastor is a contractor, and he is working on restoring the heating and air. Haydn has rallied other volunteers to add doors and windows and received donated space heaters and blankets as well. Socks, shoes, pants, shorts, belts and jackets were delivered within three days. Haydn found another couple that has donated a small generator, until power can be restored to the residence. Through his personal contacts and tireless effort, Haydn has worked to make a difference in the life of his patient. Haydn “answered the call” with compassion and empathy both on and off duty. Haydn was nominated by his partner Kelentra McGill, who shared this story. 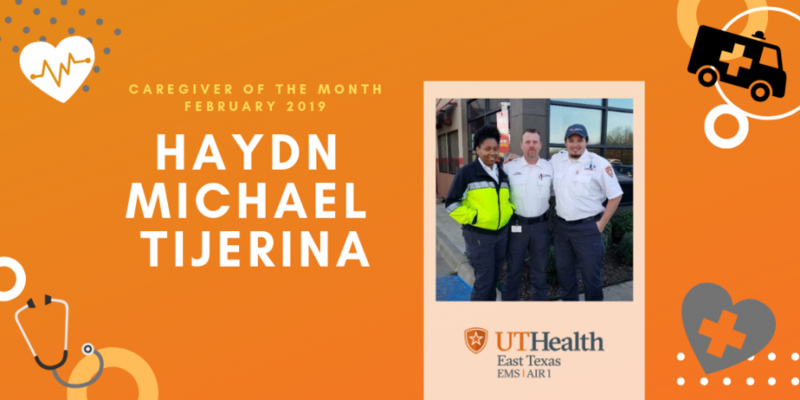 The Service Excellence Committee for EMS|AIR1 is proud to announce Haydn Tijerina as the February 2019 Caregiver of the Month.